The Nelson brothers of Goshen New Hampshire speak from experience; they did work on a farm, and they engaged in prolific labors as writers and artists. The Nelson family lived in a small rural community, where the three older boys—Walter, Arthur, and Elmer—helped with haying and sugaring, grew vegetables, and loved to hunt. The family subscribed to the popular juvenile periodical The Youths’ Companion and held “lyceums” at home. During the 1880s and 1890s the brothers produced over 63 small home-made illustrated books in a wide range of genres. Most of these books narrate the boys' outdoor play in a "World" they imagined on three small islands in the brook that ran behind their house. 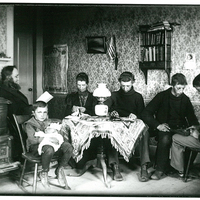 The Nelson's also recorded daily life in Goshen, writing realistic essays and shooting over 500 photographs with cameras they obtained as premiums for selling subscriptions to The Youth’s Companion. Find the Nelsons' life writing and photographs together with basic biographical information in the "Family" section of this exhibit. 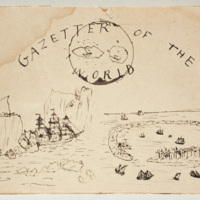 Read their home-made books and find out about the context and creation of the Nelson brothers' imaginary world in the "Library" section of this exhibit. Such an archive of writing and artwork by nineteenth-century children is rare for any kind of childhood, but it is even more extraordinary for a rural household of modest means. Families like the Nelson’s might seem to be outside the historical record, but the boys kept a detailed history of their home lives, of their town, and even more amazingly, of their imaginative play in a "World" of their own invention. This archive is a testimony to the magic of the ordinary. There is much we can learn from the curiosity, pleasure, and deep engagement with which the Nelsons lived their lives and made them into stories. Welcome to the worlds and works of the Nelson brothers of Goshen New Hampshire!